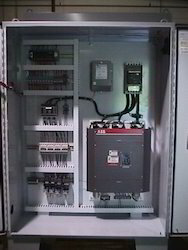 We bring forth an outstanding range of Soft Starter Panel to our valued clients. Offered range of starter panel is manufactured using optimum grade raw material employing sophisticated technology at our end. These panels are widely used in controlling high inrush current while the motors are switched on. This range of panel is also used to protection of any damages in case of higher initial torque. Moreover, clients can avail these in various sizes, grades and dimensions as per their needs and requirements. Looking for Soft Starter Panels ?